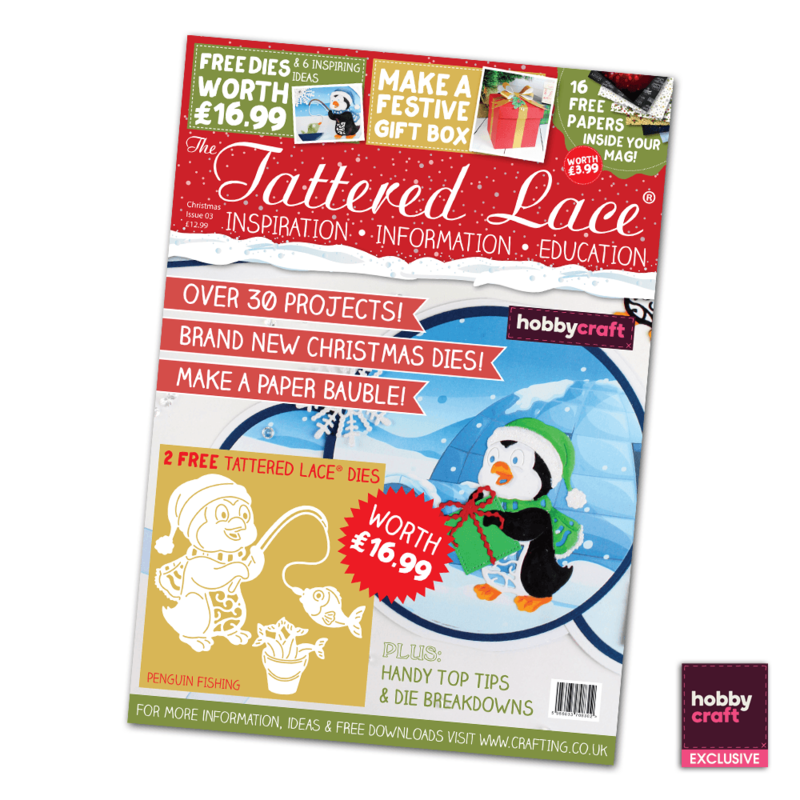 We are absolutely delighted to bring you the third Tattered Lace Magazine Christmas Special! It is a fabulous edition using Tattered Lace dies that have been designed specifically for, and are exclusive to, Hobbycraft. We’re sure that you are going to love the FREE gift, the cutest, cheekiest penguin having a great time catching his (or her) Christmas dinner. Perfect for children, for teens and everyone else. We have six gorgeous projects, spot on for a dash of inspiration! The collection of exclusive Hobbycraft Christmas Tattered Lace dies that are featured in the magazine are a lovely pot pourri of traditional, fun and contemporary themes, all designed to enthuse. Don’t forget that there are more beautiful dies available in store, try mixing and matching the projects with some of the other dies. You will love the quirkiness of the Festive Cuckoo Clock and the elegance of the Bauble Scene. The Ornate Stag and the Enchanting Snowflakes projects bring in that frosty contemporary feel that is so very popular and a delight to work with. The Sleigh Ride is all about the magic! Don’t forget you will get your FREE papers in the centre of the magazine. As soon as you get the die out of the packaging and tease those papers out of the magazine you can get crafting straight away.